Lovely, relaxing estuary village cottage. 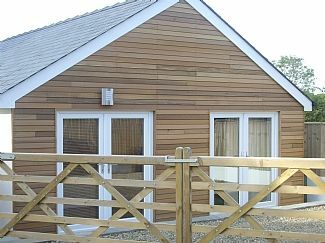 Cottage in Hook, Haverfordwest, Pembrokeshire, Wales, UK - Great Location for exploring Pembrokeshire! Welcome to our Garden Cottage, perfect location for a relaxing getaway or for ramblers/walkers/adventurers to explore the National Park. The cottage sits within the boundary of our main residence, but is completely enclosed and private. The property has its own driveway. The property is furnished and decorated to a high standard with a mix of antique and contemporary furnishings. There are 2 bedrooms and all accommodation is on one level. There is a fully fitted kitchen and bathroom. The kitchen overlooks the views of fields and trees to the rear of our property. The lounge and master bedroom are very light, sunny rooms, the lounge having double aspectj patio doors to the front of the property. There is a patio area with table, chairs, umbrella and BBQ. My family and I live in Pembrokeshire. I was brought up in Pembrokeshire and moved away to England in my early twenties. Luckily I met a partner in my thirties and he loved Pembrokeshire as much as I and so we have returned and settled here with our two small children. We love the outdoors and spend a great deal of time both at the beach and in the woods here in Pembs. I looked at lots of property but settled on my cottage mainly due to the location - quiet village on the very edge of the Cleddau Estuary. There are lots of beautiful walks around the village and Estuary which we often do with the dog - we own 4.5 acres to the rear which you are quite welcome to use! We can easily access Pembroke Dock and the beaches of South Pembrokeshire - Barafundle etc. However the property is also close (4.5 miles) to Haverfordwest (County Town). The Bathroom is freshly decorated with WC, pedestal wash basin, bath with shower over. The lounge/dining room contains sofa's for 4, oak dining table that seats 4 or 6, 4 antique 'schoolhouse' dining chairs, TV cupboard with flat screen TV, freeview, DVD and stereo. The Kitchen is fully equipped with LPG freestanding cooker, washing machine, microwave, fridge with freezer compartment. I spend a great deal of time in the kitchen, so have thought carefully of everything you might need. Golf courses are situated in Haverfordwest approx 5 miles, Milford Haven approx 6 miles away, Rosemarket Golf Club 2 miles and Mayfield Golf in Freystrop 2 miles. Notes on accommodation: We will also accept dogs. However we will only accept 1 medium dog i.e. Collie/Labrador or two small dogs i.e. Jack russells. The dogs are not allowed in either of the bedrooms. Additional cost of £15.00 per dog. Winter heating surcharge from October to April £15.00 per week. Can provide travel cot, high chair for little ones. Outside: To the rear of the property, you may enjoy a glass of Chablis on the patio whilst the sun is setting and you are watching the wildlife in the field beyond - we often see pheasant, fox, rabbit and lots of different birds. One may access the right of way across the field from the back of the cottage to various walks around the village and the estuary . I have some raised beds containing organic vegetables, herbs etc which you are welcome to tend if you are missing your own cottage garden;-) There is some childrens play furniture, table, four chairs and umbrella along with small Weber BBQ. There is a farm shop just a couple of miles away supplying the best of local produce including organically reared pork and local welsh black beef. On a warm Saturday afternoon, you may wish to sit at our Hook Cricket club and watch our team take on their rivals or head over to the Jolly Sailor where you have incredible views up the Milford Haven Waterway. Cleaning / Towels / Linen / Maid service: Linen is provided, 1 set of towels are also provided for the week for shower etc. beach towels can also be provided if required for 5.00 charge. Please request. A lovely little place to stay. The property was really cosy and tastefully decorated, had everything we needed, which made for a very comfortable stay. There was some cheese, eggs, bread, Welsh cakes, milk and butter in the fridge, tea and coffee ready for us which was a really nice and welcome touch after our long trip. Highly recommended. Great place to stay, amazing walks. Owners very welcoming and very helpful if you need anything. We are situated in a great location to enjoy all of Pembrokeshire. St Davids and Whitesands are approx 20 miles, Newgale 13 miles, Tenby 17 miles, Barafundle Bay 15 miles, Freshwater West 16 miles. Cardiff is nearest airport. Train Station is Haverfordwest. One really needs a car in Pembrokeshire. We do have a local bus bound for Haverfordwest and from Haverfordwest, you may take a bus towards Fishguard, Narberth, St Davids or Milford. We also have a Coastal bus which is excellent for hopping on and off - great for dropping the car and walking the coastal path - the bus can you take you back to collect! Fishguard and Pembroke - major ferry routes to Ireland. Haverfordwest 4 miles. St Davids - Smallest City in Wales 20 miles. Milford Haven 5 miles. Narberth - lovely shopping and eating 15 miles. Preseli Mountains 15 miles. Newport 25 miles. We have a lovely local shop run by our beloved Doreen and Brian, one can pretty much buy anything you need here. Mayfield Farmshop is 2 miles away and Tescos, Morrisons, Aldi's etc are in Haverfordwest. We are lovers of good food so are able to offer information on all types of eateries....For children, Folly Farm and Oakwood are not to far away and just in case it rains, Haverfordwest has a new leisure centre. Booking Notes: A 25% deposit is required on booking. Full payment is required 6 weeks prior to arrival. Contact me for further terms. Changeover Day: Saturday is an ideal day for changeover but I am flexible, I can also accomodate long weekends etc - contact me for your specific arrangements and I can provide costings/availability etc.